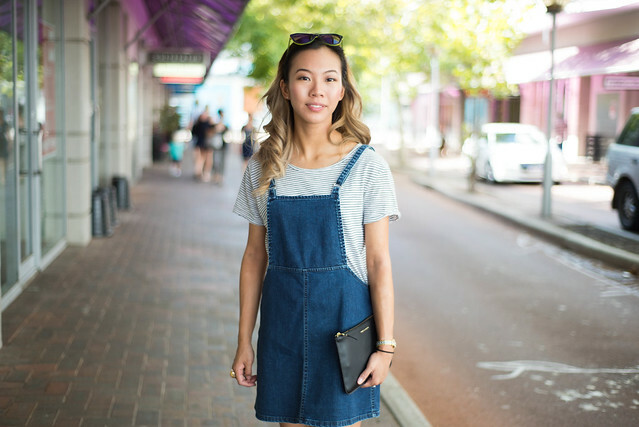 Do you remember back to last year when I was obsessed with this Uniform Studios pinafore? Well they FINALLY re-introduced some S/M ones in indigo which I so happened to stumble upon & purchase without second thought. No guarantees there's still some online, but one can dream. This pinafore is recommended for someone without qualms about looking twelve or resembling a juvie wait-staff. Can I just pause a moment to tell you how awesomely functional that Comme Des Garcons pouch I'm toting is? Claire (from the late The Harbour Master blog) has one in an iridescent finish & raved about it's enduring strength after being stuffed full of stuff & chucked into bags. Quite the indestructible classic.